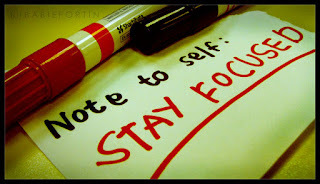 How can I stay focused enough to write? That's the question on every writer's mind. In a day and age where we can easily sit at our computers and sift through blogs and pinterest and tumblr and facebook until drool drips from our mouths and into a massive puddle on our laps, it's a wonder novels get written at all. (You're welcome for the visual.) While I am definitely guilty of wasting enormous amounts of time, I have discovered several tried-and-true strategies that just might work for you too. 1. Keep as few tabs, windows, and programs open as possible. I am notorious for running too many programs on my laptop at once. This is no bueno. If your computer is hindered from operating speedily, you're going to have a bad time. There's nothing like typing something fantastic and having to wait two minutes for it to appear on the screen. (Gotta love Word!) Also, leaving a slew of programs and web pages open will make you feel like there's something other than writing you should be doing (meaning that you'll be back to pinning pictures of kittens in teacups in no time). Quit the programs you're not actively using and free up that RAM for more important things! Remember how your parents nagged you to keep your room clean as a kid because it would 'help you get more stuff done'? (No? I'm the only one?) Well, it's true. When my desktop is covered with random crap, I don't feel like writing. I feel disorganized and, therefore, not in the right mindset to get anything done. Ever watched Hoarders? Notice how impaired those people's lives are by the clutter which surrounds/engulfs them? Computer clutter can have similar (albeit much less severe) mental consequences. Organize your files, keep your desktop looking tidy, and give yourself a nice, calm background that won't distract you while you write. Your family is distracting. Your cat is distracting. The mess you call your bedroom and/or office is most definitely distracting. If at all possible, go to the public library or your local coffee shop with your laptop and charger in hand. Leave your distractions behind. I have mastered this trick so effectively that Starbucks has become my unofficial office. I get there, order the same drink, sit at one of two choice tables (whichever is available), and am able to write for several hours straight because I've conditioned myself to associate coffee shops with intensive writing sessions. These lists can be written*, typed, or left free-floating in your head. What matters is that you have some idea of what needs to be done and how it fits into the bigger picture of what you're trying to accomplish. What strategies do you use to use to deter/avoid distractions while writing? Let me know below! Note that I didn't mention anything about disabling your internet connection. While that strategy works for some people, it most definitely doesn't work for me. I'm not one of those people who does well on an all-or-nothing model. As long as it's in moderation, I feel that using the internet during a writing session is an A-OK thing to do! I love WorkFlowy.com for list-making. It seems to fit your habit of lists and sub-lists and you can print them out (I find&replace the dashes with check-boxes), export it, and keep it online. Ooh, how fun! I think I'll join up. Thank you for passing this link my way!